Cette villa d'une chambre est à seulement quelques pas de la plage intacte de Playa Palo Seco. La villa fait partie d'un 23 acres propriété de vacances haut de gamme qui est magnifiquement paysagé et comprend une piscine bien entretenue et sécurité 24/7. «Immaculée» est le meilleur mot pour décrire la propriété. Si vous aimez le confort tout en communiant avec la nature à une plage privée qui est intacte par le développement, singes regardent sillonnent les mangroves derrière le condo sur le chemin de la plage tous les jours et couchers de soleil inoubliables, cet endroit est fait pour vous. Si vous êtes à la recherche d'un endroit abordable pour passer quelques nuits, des semaines ou des mois, cette villa est parfaite. La villa est située dans un emplacement idéal si vous voulez explorer le Pacifique Central! La salle de bain est moderne avec cabines de teck et un comptoir de granit. Il ya un évier. La douche est une douche à l'italienne qui est beautfilly carrelée. Steve's place far exceeded our expectations. The kitchen was very well equipped. It even had plastic containers that could be sealed to take cut up fresh fruit to the beach for breakfast. The bed was large and very comfortable. The AC worked very well to cool down the bedroom while we were sleeping. The internet worked very well. Every fourth day house keeping would change the bathroom towels. Every eighth day they would change the bed linens. The grounds of the villa were exceptional. From the screened in sitting room we could watch iguanas, white faced capuchin monkeys, and numerous bird species. The pool was very large and a wonderful place to spend the late afternoon to cool down. We would often visit with the other guests during the afternoon cool down. We were able to borrow bicycles, boogie boards, and a bbq at no charge. I am 65 years old and the bike ride into Parrita was easy, In Parrita every third day I would pick up fresh fruit, baking, and groceries; and bring them in the basket on the front of the bicycle. The beach was virtually empty. There was hardly a rock to be found on the beach. You could boogie board, walk the beach, or relax sitting under a palm frond roofed cabana. Some of the local Ticos would surf, others would be fishing from the shore 750 m toward the mouth of the Parrita River. There is a restaurant within 250 m of Steve's place serving local cuisine and drinks. If you enjoy peace, nature, and solitude this is the place for you. If you are the partying type than Steve's place is likely too quiet for you. Villa las Flores was wonderful.The grounds are beautiful, the pool is awesome and the beach is a 5 minute walk thru palm trees. Steve’s unit had everything we needed. Woke up every morning to monkeys, Macaws and all sounds of nature right at our back door! A great place to relax and enjoy life. It is close enough to the busy areas of Quepos and Manuel Antonio for day trips. A car is recommended as the villa is a ways from anything. Would definitely consider staying there again. It is a perfect place and comfortable whith the 2 verandas. we will be back. It is a very quiet place and close to the Beach, but you need a car to go around and the grocery. The property was clean and the air conditioning and internet worked fine. Since the unit is not regularly occupied, some critters such as centipedes, beetles and assorted other insects come to visit. A door sweep under the front and side doors would mitigate this somewhat. Also, there are some little fast moving insects that will come out and begin feeding on any food residue, on the stove or counters in a short amount of time if not kept thoroughly immaculate. A thorough application of Boric acid powder in all corners of the cabinets below the sink, and the pot and pan cabinet, as well as behind the stove would most likely eliminate the problem without resorting to pesticides. I've used Boric acid and it kills all manner of bugs who walk through it. Also, the toilet needs to be updated to a high velocity suction toilet. The American standard is not working properly especially since the waste line does not have a vent pipe which goes through to the roof. Vent pipes naturally increase suction and aid in flushing the toilet. Even with not putting toilet paper down the toilet, it needed to be flushed three times to eliminate all waste. The plunger needed to be employed as well. Toto makes a great toilet which I have in my home and I never have an issue. I highly recommend updating the toilet ASAP with a Toto. The washer has issues, and would not go a full cycle without resetting it, and still did not wet all the clothes and wash properly. In addition, the refrigerator compressor is very loud , and you have to close the door to the kitchen while sleeping, otherwise it will wake you if you are a light sleeper. The proximity to the beach and to Quepos and Manuel Antonio was great, and we enjoyed the abundant wildlife as well. We enjoyed our meals at Clandestino 5 km down the beach at Playa Seco. The Bike and Boogie boards supplied by the complex were great, and the pool at the complex is awesome. Some minor upgrades would make this property pretty flawless. I enjoyed my time there very much. loved the private and quiet little property! it was much more spacious than we expected and the screened in patio rooms in front and back of studio were wonderful! we saw large iguanas and monkeys in the backyard, tons of humming birds, the flowers and landscaping was beautiful! The kitchen came well equipped with utensils and even some ingredients/spices etc that people left behind. The beach was a super short walk and it felt like a private beach! You could walk for 40 minutes one direction and only see 2 people! The Costa Rican people were SOO friendly! My friend and I went and as two women we felt very safe! The only things that could have been better were: the AC was not reliable at night (it kept turning off, they sent someone, but it was only resolved for a short period... so we slept in the back patio room with the windows open), the shower was a little messy without a door and the internet was not reliable... however that's what you get when you travel to a foreign country. Overall, we were SUPER happy and would like to return! Playa Palo Seco (également connue sous le nom de La Isla Palo Seco) est une plage relativement peu découverte à 5 minutes de la ville ouvrière de Parrita. La plage est très privée avec du sable volcanique noir et de grandes vagues de surf. Elle est parfaite pour des promenades sans fin ou des balades à vélo sur la plage. 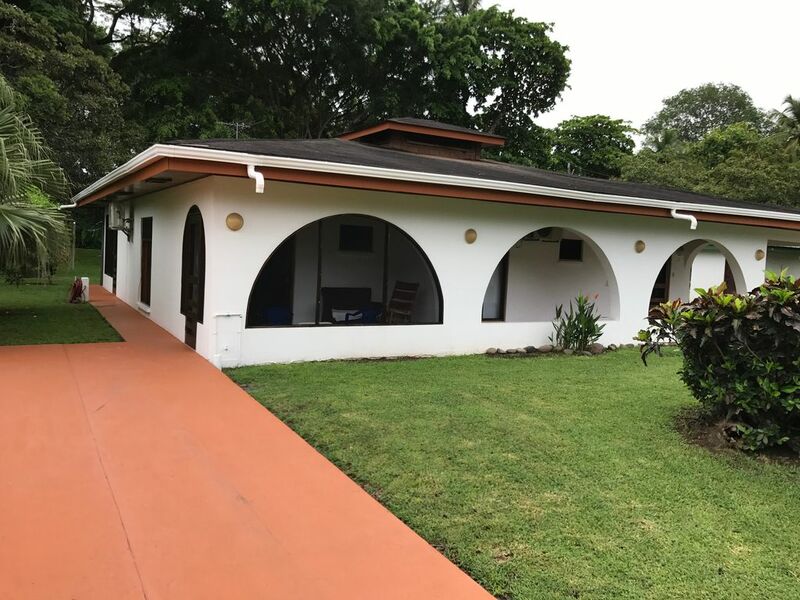 La villa est située dans un emplacement idéal si vous souhaitez explorer le Pacifique central par vous-même: environ 30 minutes pour Quepos / Manuel Antonio et environ 40 minutes pour Jaco. Dominical est un peu plus d'une heure maintenant que la route de Quepos est terminée. 25% deposit guarantees reservation (refundable up to 60 days prior to occupancy).